Today’s painting concentrates on rising mist, always fun to see if the oil pastels will produce the effect I was looking for. 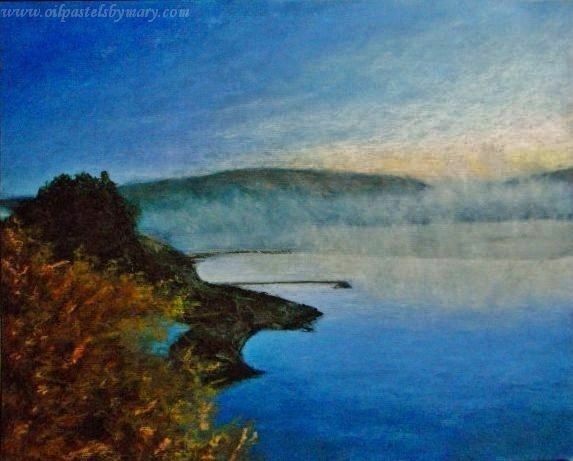 Mist at the Reservoir (8×10), is an oil pastel painted on blue-tinted heavy card stock using mainly Senneliers and Neopastels – both brands are very soft and the Senneliers are buttery for easy spreading. Thanks for stopping by . . . time to begin selecting several snow scenes to paint for our annual Christmas card. A reference image used was from my friend John Robinson, a wonderful photographer from pmp. 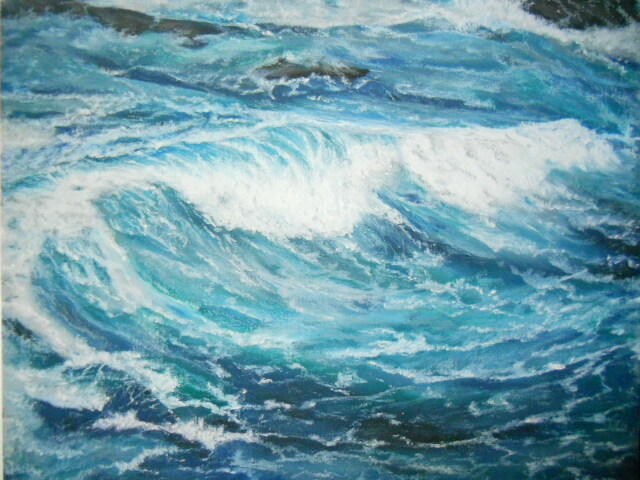 This entry was posted in About Oil Pastels, OPs New Paintings and tagged Mist, oil pastels, painting, reservoir, water. Bookmark the permalink. You’re a wonderful artist. I love oils, I stopped using them some while back, but you can’t duplicate an oil with the other mediums, the richness of beautiful layers! Thank you. Thank you so much for your compliment – means a lot. There is a richness with oils that is unmatched, only problem with oil pastels is you can’t be pre-mixed with oils to get the subtleties of colors. Have you tried watersoluable oils – perform the same, wonderful richness but without the toxins. We both were concentrating about on the same topic this week, you on rising mist and me on rising steam in photography. I have an idea for you. What about adding small videos once in a while of you working on a painting? I think it could be an added bonus to your blog. So funny Laurie – what a “steamy” topic! Perhaps I’ll put on my blog a video next year of painting an oil pastel. I’ve never made a video before, editing it down or speeding it up – another new project (lot of learning to do, but something worth thinking about). Thanks for the idea. So very beautiful Mary! I can imagine how difficult that effect must have been to achieve. Mary, this one is so beautiful. Love the deep rich colors. I’ve been thinking the same thing about our Christmas card. 🙂 Have a great day! Thanks Janell, I’ve made a few adjustments to seat the jet of middle-ground land – reads better now. I spent some time yesterday figuring out what to paint, have about 20 scenes I’ll cut it back more as I’m finishing up my snow color samples. Thanks and have a great weekend at your exhibit! Hi Nigel, thank you for your comment and feedback – means a lot! Wonderful for the peace of any season. Thank you Frank – really appreciate it! Your mist is beautiful. I tried a misty painting of mountains once. I think it finally worked, but it was hard to get it to be what I wanted. Kudos to you for such a beautiful and successful painting. Thank you Carol, this was a faster painting than normal but the mist was worked over for or five times. It was a bit of a challenge, but again let me get a feel for smearing the OPs really lightly to get the effect. A little too symmetrical, so I’ll probably go back in and play with the piece again – oh now, just what I didn’t want to do, ah well. Thanks Poppy! Oh yes, can you believe it – I haven’t decided yet what to paint and will probably do 4 or 5 pieces to see which fits the season. Actually have a photograph of the street we lived on in Maine after a very heavy snow storm and it looked like a snow-filled pathway with pine tree limbs heavy with snow hanging down oh so low – really quite beautiful. Then there’s the one with our famous lighthouse, Portland Headlight, after a snow storm with bright blue sky and roof-top covered with snow. So many wonderful choices – what to do. So nice John, thank you very much! I just love your work Mary, you are so talented. Thank you Karen, always appreciate your kind comments! A really nice effect achieved here, I believe is not an easy task to accomplish but you can manage so many challenges Mary including this particular one. Looking forward to see your snow scenes, white on white is never easy to paint! Very much looking forward to snow scenes….the mist is a nice change from the norm! Thank you A – appreciate it! Thank you Jet, really appreciate it! You have caught it – the rising mist. Must be very difficult to do. Thanks Dorann! Oil pastels can be tricky, if they aren’t hardened a little, then it’s real easy to smear the paint right into the under layers and lose the whole effect.